Street Fighter III: 3rd Strike Online Edition's upcoming music and color packs prove that no matter how old the game, Capcom can always add downloadable extras. 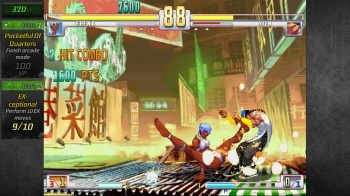 The game (henceforth Street Fighter 3 Online for brevity's sake), hit the Xbox Live Arcade and PlayStation Network last week, and the critical and consumer response has been overwhelmingly positive. Capcom, being Capcom, would like to keep this nostalgic joytrain rolling (while picking up some extra cash), and have thus announced a spate of upcoming downloadable additions for the fighter, including new character colors, music from earlier Street Fighter 3 games, and more. We've been getting a lot of questions from fans about what DLC we're going to be offering for SF3. Today, I'm happy to be able answer those questions! In addition to "Color Pack 1" (and future color packs), we're proud to announce several other DLC offerings today, which should be showing up in the next month or so. The first of those announcements is: a set of Music Packs(! ), which add new songs. Specifically, they add...all the character themes from the first two Street Fighter IIIgames, "New Generation" and "Second Impact"! Further, Capcom also promises upcoming DLC "Match Packs" that include "over an hour worth" of replay content from a semi-secret tournament the company held recently among 16 of the world's greatest Street Fighter 3 players. Each match pack features professionally recorded commentary from famed SF3 player James Chen, and should appear "later this year." So far there's no word on what sort of price Capcom will set for these things. So what do you guys think? Awesome? Not awesome? I've been wondering if that "Downloadable Content" tab in the game was going to offer anything other than unlockable keys for Gill and the dipswitches, and I suppose this is my answer. Admittedly, it's not exactly the downloadable robot Zangief I had my fingers crossed for, but I do dig the tunes from 2nd Impact. Yes Capcom, you'll get my money. Again. Try not to look so smug about it.